This piece is suspended from the ceiling by a very fine wire that's barely visible, causing the piece as appearing to float. 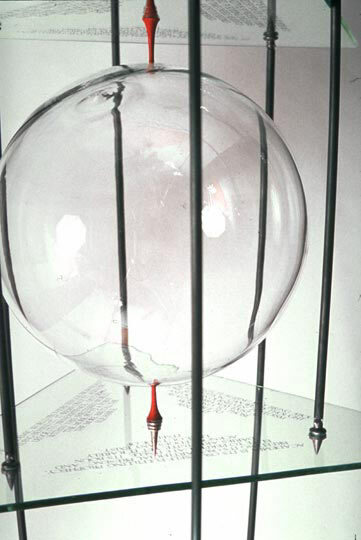 Six steel rods encircle the glass sphere. One end of each of the rods connects to a sterling silver part that projects through one of two large triangular glass plates. Each of these glass plates has three such connectors. The opposite ends of each of the steel rods terminate as they connect in a similar manner to one of two small triangular glass plates. 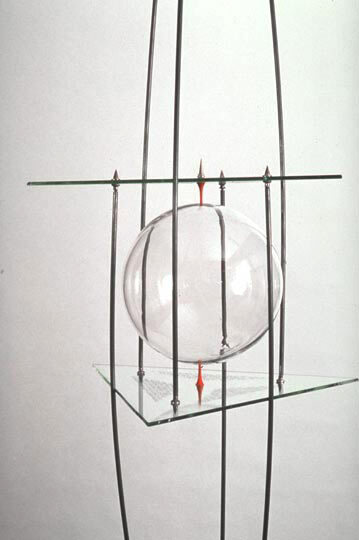 In essence, the steel rods form a sort of cage around the sphere. Located in the center of each of the large glass pieces is a bronze element that comes nearly to a point. These are arranged in such a way that the glass ball is trapped between them, bearing down heavily on the sphere and threatening its existence. 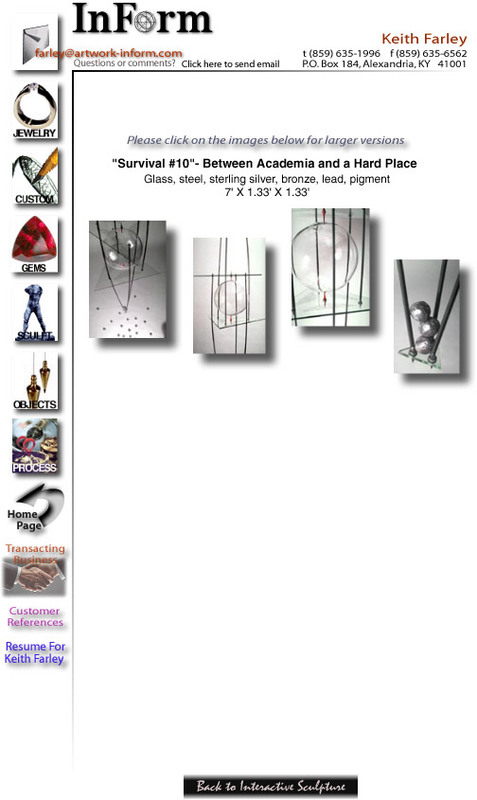 Placed on each of the large glass triangles is text expressing thoughts regarding some experiences involving academia. 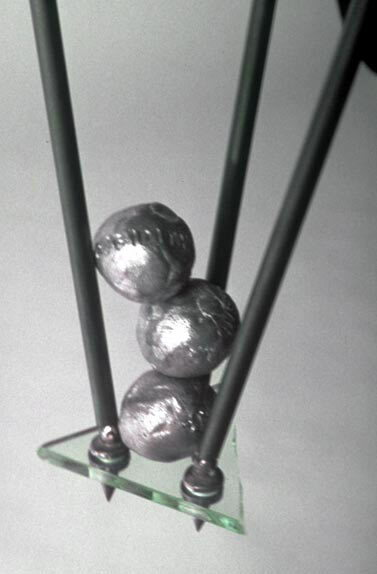 Connected to both of the outer ends where the steel rods intersect the small triangular glass pieces are a series of lead balls. Each of these balls has a word or phrase stamped into the surface that makes even more specific reference to my academic and post-academic experiences. 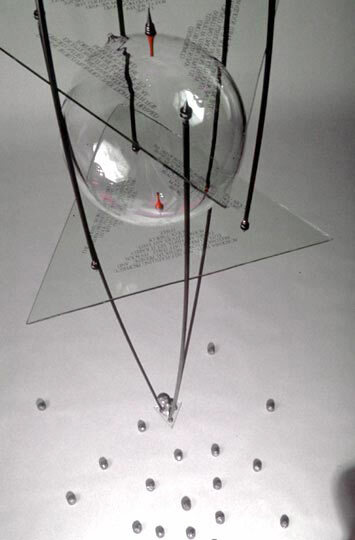 Below the suspended piece are randomly located lead balls, again with a word or phrase making a specific reference to academic experiences. I've more recently found another approach to placing these lead balls under the piece that brings a more formal order to it. Sooner or later I'll make a point of re-installing this piece and shooting pictures showing this new approach. Please click on the above images to view larger versions of each.